Ireland’s history of famine and oppression – especially the historic refugee crisis sparked by the Great Hunger of 1845-1852 – in many ways echoes the crises we see today in the Sahel, where 20 million people are facing starvation driven by brutal and persistent droughts. Editor’s Note: The Executive Secretary of the United Nations Convention to Combat Desertification, Monique Barbut, came to Ireland on 26-27 March 2018 to help launch the SMA’s Laudato Tree Project. While there the Society of African Missions facilitated a major meeting with the Irish Government during which Madam Barbut presented a proposal inviting the Irish Government to play a leading role in Europe and internationally in championing Africa’s Great Green Wall. The SMA Communications Office negotiated with the Irish Independent an Op-Ed by Madam Barbut in which she outlined aspects of the proposal. The Op-Ed was published on 27 March 2018, in advance of her meeting with the Irish Government. Below we reproduce Madam Barbut’s Opinion Editiorial which offers both inspirational and hope-filled possibilities around the building of Africa’s Great Green Wall. Africa is growing a wall, unlike any other in human history. Not a wall made from bricks and mortar, or barbed wire fences. But a Great Green Wall that promises to grow solutions to Africa’s most urgent challenges – including mass migration, drought and impending climate breakdown. By 2030, this African-led initiative aims to green 100 million hectares of degraded land across the world’s poorest region, the Sahel, and spark a Continent-wide movement that will create 10 million jobs in rural areas. The initiative provides global benefits too – forecasts suggest that the 13 countries involved will sequester as much as 250 million tonnes of carbon, through its evolution. Once complete, the Wall will stand as a true human wonder: spanning an extraordinary 8000km across the entire width of Africa,from the Atlantic Coast of Senegal to the Red Sea of Djibouti. 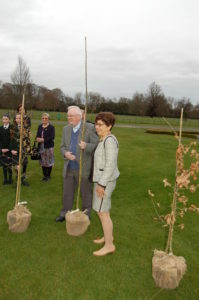 Yesterday, I had the great honour of speaking at an event hosted by President Michael D. Higgins at Áras an Uachtaráin, concerning Ireland’s role in supporting this urgent initiative.The occasion was the inauguration of the Society of African Mission’sLaudato Tree Project, which links the promotion of biodiversity in Ireland with a developing and hope-filled new world wonder – Africa’s Great Green Wall. During the event, His Excellency, President Higgins, articulated his firm backing for the Great Green Wall initiative, urging strong Irish leadership; I am extremely hopeful this will now extend itself to the highest levels of Government here in Ireland. Youth from rural areas of the Sahel are on the front line. By 2030, 60% of Africa’s workforce will be under the age of 24, and will have to contend with the potentially catastrophic social and political fallout of climate change and rampant desertification. Communities here depend heavily on rain-fed agriculture, a sector that still makes up 80% of jobs in the Sahel. But the land’s rapidly diminishing productivity is fuelling mass migration, unemployment, conflict and radicalization. I saw the stark reality of this when, in 2016, I visited Agadezin northern Niger. Previously a tourist and trading centre, Agadez is the principle migrant hub in West Africa. It is now known as the ‘Gateway to the Sahara’. Thousands of young men and women are being forced to abandon their homes and risk their lives crossing the often lawlessSahara, hoping to find a route to Europe. Without exception, all of the migrants I met were young people from ruralareas. In the past, seasonal migration helped communities cope with difficult times. Not anymore.No longer able to live off the land due to increased droughts and dwindling agricultural yields, many young people see Europe as a way out of grinding poverty. Many, like the Irish on board the coffin ships crossing the Atlantic Ocean, have perished in the Mediterranean Sea. It is forecast that as many as 60 million people could leave degraded areas of Africa in the next two decades. The alternative is often even worse. Competition and conflict over the productive resources that remain is growing. Lake Chad, one of the region’s lifelines, has lost 90 percent of its surface area in less than a generation due to desertification and climate related processes. It is no coincidence that the terrorist group, BokoHaram, is especially active in the area around the shrinking lake. For African youth in particular the potential for radicalization or conflict is not an abstract or distant threat. It is a daily reality. The Great Green Wall promises to be a real game-changer, providing a brighter future for rural youth in Africa and a chance to revitalize whole communities. It can unite young people around a common, epic ambition: to ‘Grow a 21st Century World Wonder’, across borders and across Africa. Its scale and ambition rivals any other human-made wonders of history. It aims to feed the hungry; give people the chance to have decent, meaningful work; strengthen the resilience of communities in the face of climate change and help peace and security to flourish. The Wall was launched in 2007 and is making huge progress across the 13 nations involved, as thousands of jobs are created in rural areas. Senegal has restored 4 million hectares of degraded land in the past decade, Ethiopia more than 15 million. major up scaling of efforts and real partnership. The Emerald Islehas a unique opportunity to help lead the way. At the 5th European Union-Africa Summit, the Irish Taoiseach, Leo Varadakar, championed strong European support for African-led solutions and the empowerment of young people. I further admire the Taoiseach’shonest and frank assessment thatIreland is currently falling short of its own 2020 climate-related targets. The Great Green Wall offers a unique opportunity to signal a new dawn, by supporting the communities that already live with the daily realities of a changing climate.The Wall’s vision of African self-sufficiency, resilience and job creation for rural unemployed youth closely matches Ireland’s international development priorities. Today, thanks to Minister Joe McHugh, I will meet with key Government Ministers to further define Ireland’s evolving role in supporting the Great Green Wall. I have no doubt that in the Emerald Isle, countries across the Sahel have found a strong ally that will stand in solidarity to evolve and advance this urgent and epic African dream.